The Malvern Hills are officially designated an Area of Outstanding Natural Beauty and are a famous beauty spot, with scenic views over both English Counties of Herefordshire and Worcestershire. The Hills run north/south for about 13km and overlook the River Severn valley to the East, with the Cotswolds beyond. The highest point of the Hills is the Worcestershire Beacon at 425 metres. The hills are famous for their natural mineral springs & wells, and were resposible for the devopment of Great Malvern as a spa in the early 19th century . There are two passes through the hills, the Wyche cutting ( Wyche means salt) and the A449 road just north of Herfordshire beacon. The Herefordshire beacon is also known as the British Camp, as the remains of an iron age hill fort can be found at the summit. The are six places with the Malvern name, Great Malvern, Little Malvern, West Malvern, Malvern Link, North Malvern and Malvern Wells. GREAT MALVERN - is the main town in The Malverns Worcestershire , England, positioned at the foot of, and partly on the sides of, the Malvern Hills. Malvern first rose to fame as a Health Spa Town in the 19th century. Its water is still bottled and exported around the world . The name was probably derived from the Celtic name Moel Bryn meaning bare hill, situated 8 Miles South West of Worcester and 16 Miles North East of Tewkesbury and is on the old Salt Routes, it can be reached via the A449 from Worcester or the A38 & B4211 from Tewkesbury. The Malvern's are clearly signposted on all approaching roads. In Medieval times Great Malvern was just a village, its hills and springs attracted Monks here during the 11th and 12th centuries which led to Priories being set up at Great Malvern and Little Malvern, now days much of the towns Victorian Architecture is still to be seen, it was during this period that Malvern expanded, with the arrival of the Railway in 1860 and following the promotion of "Water Cures" by Dr Wall much earlier in 1756 that much building took place. The Malvern Hills and surrounding areas have been an inspiration to many Authors, Composers and Artists such as Sir Edward Elgar, C.S. Lewis was said to have been inspired to write the "Chronicles of Narnia" , John Masefield , William Langland and Lord Byron had an affinity to the area as did Jenny Lind ( the Swedish Nightingale). Lewis and Tolkein were good friends with George Sayer, and the three used to walk on the Malvern hills. The range of hills extends for 9 miles and rises to 1395 Ft. at its highest point , there are many footpaths for the visitor to follow , some of these were constructed at the expense of wealthy benefactors who had footpaths named after them, there are many water spouts dotted about the hills which attract visitors and locals to fill their own containers. The Iron Age Hill Fort is an attraction for the more energetic and can be seen from many miles away its profile being most distinctive. It has been claimed that at the Summit of the Worcester Beacon 15 Counties can be seen. Walkers exploring the hills are well provided for with the facilities that are available including ample car parks and a regular bus service to the hills. 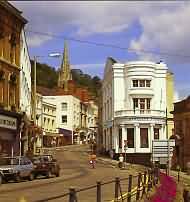 In Great Malvern there are many eating places, with Pubs, Hotels , Cafes and Restaurants all providing food at a variety of prices. This ancient church was built in Norman times and is worthy of a visit , it has a wealth of 15th century Glass in superb colours and design, there are Monuments, Effigies and Tiles which bear the Arms of Edward the Confessor and of the families of Mortimer , Bohun, Clare, Despencer , Beauchamp and Stafford. There is an area devoted to the sale of books and cards . The theatre started its days as an assembly room and was opened in 1885 an was considered at that time to be one of the best in the Provinces, many well known and international actors have appeared here and continue to do so. In 1997 the theatre closed for a major refurbishment this followed a lottery grant of 5.2 Million pounds, on the 24th April 1998 the theatre had the pleasure of staging the first performance in the refurbished surroundings this was performed by Nigel Kennedy playing Beethovens Violin Concerto . With the facilities of comfortable seating , a Restaurant and Bar the Theatre makes it an ideal venue for an entertaining time. Adjoining the theatre are the Priory Park Gardens not only do these provide a place for a breather during the interval but also provide a place for relaxation on Week ends when a Band plays in the Bandstand. In the same complex as the theatre there is a Cinema which shows the latest films. See www.malvern-theatres.co.uk/ for more information. This tiny theatre was at one time a public toilet(a Victorian Gentleman'sLavatory) and holds seating for 12, since its opening in 1999 it has proved to be a popular attraction , being the smallest theatre in the world it is entered in the Guiness book of records 2002, the proprietor Dennis Neale has been successful in playing host to International Puppeteer Andras Lengrt of Hungary who proved to be very highly rated. For information on performances Tel. 01684 568 933. This Leisure pool with wave machine has many facilities and has a fitness room with cardiovascular equipment, saunas, dance studio and a Cafeteria , the complex was completely refurbished in recent years and offers up to date facilities, it is possible to hire the facilities for birthday parties and special needs groups. For further information Tel. 01684 893423. Malvern was famous for its water cures , the theraputic cures reached their peak in the Victorian era, water from the hills was piped from the Primeswell Spring to a bottling plant in the nearby village of Colwall, this plant was operated by Coco Cola Schweppes (now closed down). The Spring is on the Western slope of the Malvern hills an from an altitude of 230 metres the water is piped a distance of 1-8km to the plant and whilst during Victorian times claims were made about magical cures no such claims are made nowdays, water has been bottled for at least 350 years and in fact the Company's archives hold an invoice that dates back to 1798, the spring that supplies the factory has been in use since 250BC. , the bottling plant was opened in 1892. A Royal Warrant was granted by Princess Mary Adelaide in 1895 and by King George V in 1911, it is at present supplier to the present Queen Elizabeth. By 1990 more than 21 million Litres was being bottled each year compared with some 7 million Litres in 1987. It is possible to drink the water from some of the water spouts , but do not do so unless there is a sign saying that it is safe to do so. A name synonymous with Malvern and a Company that enjoys a World Wide reputation for its reliable engineering and hand built coach building, founded in 1909 this company is also dealing with technology of the future, joining forces with the scientific company Qinetiq it is to build a car from which the only emission will be water vapour, it will be the worlds first environmentally friendly sports car, it is based on the Morgan Aero 8 , the first sports car with an aluminium chassis, it will be known as the Life Car and instead of petrol it will be powered by a Qinetiq fuel cell which converts Hydrogen and Oxygen taken from the air into Electricity , the only waste product from the car will be water. The project is expected to take about in between 2 and 3 years with the prototype in Malvern. It is possible to visit the works at Pickersleigh Road, Malvern Link and to see their present range of cars being built, as numbers are restricted arrangements should first be made by telephoning 01684 573104,( open Monday to Thursday). It is possible to obtain refreshments on site. For further interest read the article - Owning a Morgan Motorcar in the Cotswolds. Situated just a short distance from Great Malvern it is reached by the A449 road and is signposted . The medieval church is of the 12th Century it was once a Priory which housed 11 Monks, it was rebuilt in 1480-1482 and is now the Parish Church. Little Malvern Court - adjoins the church and was once a 14th century Priors Hall , it is open to the public with limited opening hours - Wed /Thurs. Mid April to Mid July. Enquiries Tel. 01684 892988. The well waters of Malvern are many - but often well-concealed. St Anne's Well (where you can enjoy a peaceful break with delicious refreshments) and Holy Well, are tucked away in valleys. But in and around the Malverns are many more springs, some well restored like the Beauchamp Spout in Cowleigh Road or the well known fountain, Malvhina, at belle Vue Island and others more obscure. Finding them makes an interesting treasure hunt. Upton upon Severn - Signposted off the A 38 from Worcester and off the A449 from Great Malvern by taking the A4104 .This Riverside Town has many Georgian buildings, with numerous pubs and eating places , it attracts many visitors , there is a Marina and places for Caravan parking . It is known for its annual Jazz , Blues, Water and Folk Festivals a popular feature being the Mardi Gras Parade. Jazz bands from all corners of the world have attended what has now become an important event on the Jazz Calendar. For - Accommodation at Upton-upon-Severn. Croome Park is just a short distance from Upton-on-Severn and is signposted from A38 and B4084. A National Trust property ,acquired by them in 1996 and being restored to its former grandeur which includes water features, gardens and parkland, once the home of the Earls of Coventry , its grounds were originally developed an designed by 'Capability Brown', the park buildings are structures designed by Robert Adam and James Wyatt, with miles of walks , open parkland , shrubberies and lakeside gardens it provides an opportunity to see �Capability's first complete landscape. For details of special events and opening times Tel. 0870 458 4000.